I came across your website while researching a couple of prints I have inherited signed 'Gisele Raderscheldt'. The prints are stamped 'Nachlass Anton Raderscheldt'. Anton Raderscheidt and his first wife, the artist Marta Hegemann, were about the best friends anyone could have. When their friend Angelika Fick Hoerle became ill with tuberculosis and her husband Heinrich and ‘friends’ deserted her, Anton and Marta stayed by her side. Life being what it is, fraught with triumphs and tragedies, Angelika died at 23 years of age and Anton left Marta and children behind. 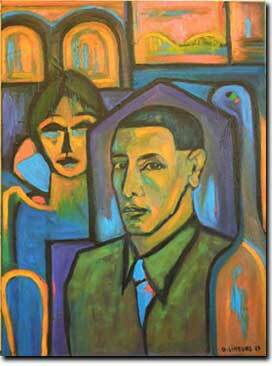 Anton left with Ilse Salberg, a well-to-do Jewish married art patron. During the Nazi era, Anton experienced great difficulties because of Ilse’s Jewish heritage. However, with luck, friends and connections, he eluded death. Ilse, an accomplished photographer, died shortly thereafter of cancer. Anton's third wife and mother to more of his children (he had had two with Marta) was Gisele Ribreau who he met in 1948. The website www.raederscheidt.com doesn't say when they married. As Anton had a stroke in 1967 and to the best of my knowledge, Gisele was not an artist, I'm guessing that she signed some of his late works between 1967-70. You'd have to describe the subject matter of the works to try to pinpoint the decade in which they originated. The good news is that I have some connections with Anton’s first family (Marta Hegemann’s son Johannes is still alive and very ‘peppy’ at 89 years of age) and the grand-daughter MAF Raederscheidt, a fantastic artist in her own right, who makes videos on artists for the "Rheingalerie" at www.center.tv (with her partner Stephan Everling). I will ask her for more information about Gisele. My hunch is that you’ve lucked into some Anton Raederscheidt works. 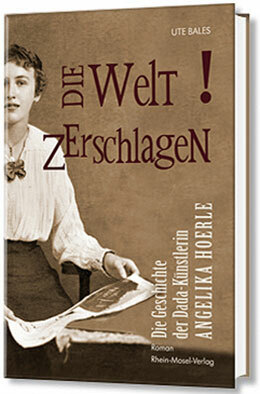 German author Ute Bales published her novel about my great-aunt Angelika Die Welt Zerschlagen: die Geshichte der Dada-Kuenstlerin Angelika Hoerle, with Rhein-Mosel Verlag early in 2016. After a full year of interacting with Ute during her research and writing, I was delighted to introduce her reading in Simonskall on April 17, 2016. Ute read to a full house in the Marienkapelle in the Eifel Mountains south of Cologne—a place where Angelika Hoerle honeymooned in June 1919. During the reading Ute played a piece of music specially composed for her book tour by Canadian composer Ennio Paola. The hushed audience was awe-inspired as The World is Smashed echoed in the beautiful chapel. 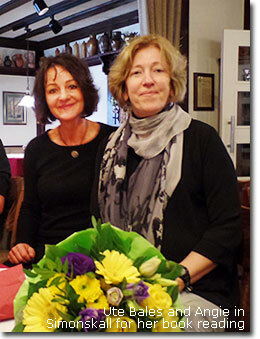 Mary Cook and Andrea Ketelaars consulted on the book`s cover—a German-Canadian co-operative venture. 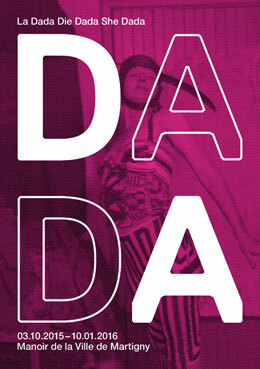 Dada a 100 ans ! En 1916, alors que la Première Guerre fait rage en Europe, Dada voit le jour à Zürich. Œuvres d’art radicales, poésie expérimentale, actions subversives, renversement des valeurs, jeu, humour, le mouvement intellectuel, littéraire et artistique entend faire table rase de toutes les conventions et contraintes idéologiques, esthétiques et politiques. 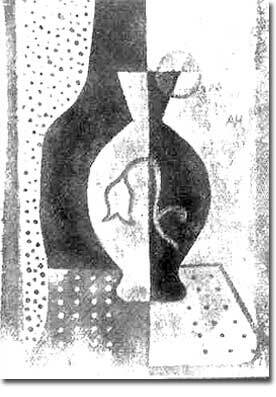 Si Dada est souvent associé à des artistes masculins comme Jean Arp, Tristan Tzara, Max Ernst ou Marcel Duchamp, au cœur de Dada se trouvent aussi, et très souvent, des femmes. Pour fêter ce jubilé, le Manoir de la Ville de Martigny propose LA DADA DIE DADA SHE DADA, une exposition en partenariat avec le Forum Schlossplatz Aarau et le Kunstmuseum d’Appenzell. Cinq femmes dadaïstes actives à Paris, New York, Berlin, Cologne et Zurich sont présentées à travers une série d’œuvres et de documents : l’écrivaine Céline Arnauld, la peintre et graphiste Angelika Hoerle, la collagiste Hannah Höch, la performeuse Elsa von Freytag-Loringhoven et la peintre et plasticienne Sophie Taeuber-Arp. L’exposition s’attache également à mettre en valeur la portée de cet héritage aujourd’hui à travers des créations inédites de cinq artistes vidéastes contemporaines animées par l’esprit de ces grandes femmes de l’histoire de l’art : Judith Albert, Elodie Pong, Anne-Julie Raccoursier, Chantal Romani et Anka Schmid. These Angelika Hoerle works were reproduced in Bulletin D, Stupid 1 and Die Schammade, but where are the originals? We know where almost all of her extant works are. Join the sleuthing to find the remainder. She was a compatriot of Max Ernst, wife of Heinrich Hoerle, friend to Marta Hegeman and Anton Raderscheidt, three of her works were purchased by Katherine Dreier to be memorialized in Yale’s Societe Anonyme Collection. She was dead of tuberculosis by 23 years of age. My great-aunt Angelika Fick Hoerle was a political activist whose art crossed styles and whose passion to make positive changes in society did not die with her. To prepare for an exhibition of her works at the Art Gallery of Ontario in 2009-2010 I am looking to find EVERYTHING THERE IS TO KNOW ABOUT HER. To do that, I’m willing to share what I know about her and Cologne dada. Join with me on the voyage of discovery. Photo above of young Angelika, me, at my uncle Willy Fick's atelier in Cologne. 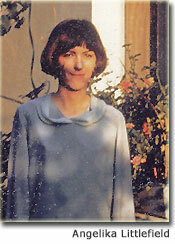 reincarnation of his sister Angelika Hoerle. 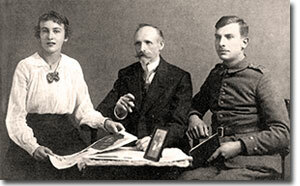 Günther Limburg recently painted Angelika Hoerle with her husband Heinrich dominating the foreground. With what is known about Angelika, this is an apt portrayal. However, with the 2009 exhibition of Angelika's oeuvre at the Art Gallery of Ontario, she will finally emerge rightfully from behind his shadow. Günther Limburg is a successful German artist whose works may be seen at www.art-in-cologne-guenther-limburg.de Guenther's current exhibition "Spurren" or "Traces" is in the Junker Haus in the Eiffel mountains outside Cologne, a place Angelika and Hoerle visited as a type of honeymoon outing in June 1910. More about "Traces" later. Angelika appears a little bit abstractly, I painted her as if she was about to vanish from this world. There is a black line to suggest her right shoulder and arm in a way as if she was standing. But there are also yellow lines which give the idea of a lying woman. Somehow I tried to show her in some state between health and illness, which is also underlined by her black eyes. Hints to Cologne are included in the Romanesque church windows and the bridge over the River Rhine which is still a very popular view at Cologne. H. Hoerle is shown in front of a throne, on which he would have liked to sit. Z206 for Angelika Hoerle, from David Annwn’s collection - check out new book "Bela Fawr’s Cabaret"
AGO "Angelika Hoerle: The Comet of Cologne Dada"